IDE Flashdisk Solid-State Storage - up to 4GB capacity! Install an IDE flashdisk module onto many of our single board computers for rugged, lightweight, solid-state mass storage. The flashdisk module works just like an IDE drive and requires no drivers. It provides high-speed nonvolatile mass storage in capacities of 128MB to 4GB. The flashdisk mounts on the IDE connector and is held in place with a spacer and screws (included). It includes a master/slave jumper and operates over -40ºC to +85ºC. 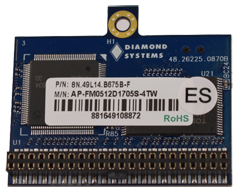 Diamond's IDE flashdisks are single-level cell (SLC) technology for faster transfer speeds, lower power consumption, and higher cell endurance. Our ACC-IDEEXT accessory board lets you connect an IDE flashdisk and an IDE drive (hard disk or CD-ROM), or two IDE drives, to your Diamond Systems' single board computer. You can also use it to load files from your desktop computer onto an IDE flashdisk module prior to installing the flashdisk onto the SBC. The ACC-IDEEXT board includes 40-pin and 44-pin mating connectors for compatibility with almost any computer and IDE device. 40-pin and 44-pin ribbon cables are included.